Just when we thought it was all over, Jenny offered me a ride on her Cub. When I had working bikes, I had intended to enter the late September BHR meeting at Cadwell, despite the lack of income, as a birthday present to myself. 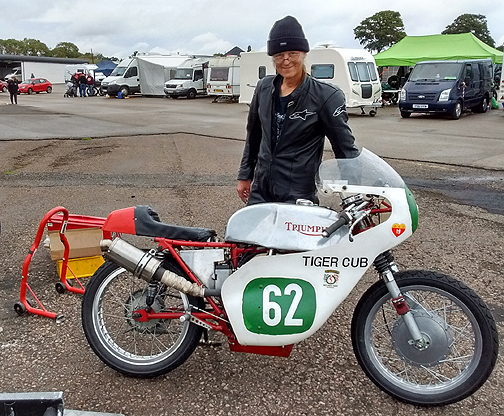 Jenny was entered for Mallory in early September and offered to share her rides as an alternative birthday present. A lovely gesture, and it would have been churlish to turn the offer down, even though I was very aware that it had not been running right when last used. A bit of work had been done on it, but nothing that had pinned the problem down. At least, if I experienced it first hand, I might be able to help solve the problem. The bike sailed through scrutineering and noise testing, and went OK for several laps in practice but stuttered towards the end. Was it something overheating? We swapped some electrical components, it started OK for Jenny's first race but soon played up again. We swapped some more bits, checked the carburettor one more time, and it fired up OK again, but what would happen out on the track again? So, two races left to go, one for Jenny and one for me. And hurrah! The bike behaved in Jenny's race, but was not keeping up with the two bikes that we hoped it could compete with, and, disappointingly, the lap times were a bit slower than in practice. Oh well, at least it looked as though I would finally get a go on it after two days of playing with it in the intermittent drizzle. At least we were parked close to the cafe so tea supplies were maintained. Come time for my race, the track was dry, so no concern over tyre performance, they were bound to be fine. I had never ridden this bike before but the warm-up lap confirmed that it felt pretty similar to my own Cub; it featured the same front brake, and stopped just as well. Starting at the back of the grid, I settled in behind one of the bikes we had hoped to beat – the other one edged away. The Cub was not quite as stable as mine in extremis, but on the last lap I was able to close up enough through the Esses to be in out-braking range at the hairpin, and hung on to cross the line a whisker ahead. Second to last instead of last, what a result! More importantly, both I and the chap I was dicing with had really enjoyed ourselves, and my lap times were comparable to my 2011 Mallory times on the Cub. So I am not quite past it yet, but Cubs really can't keep up with the Hondas, some of which are now quite ridiculously fast and dicing with 500's in some races.